You've bought tons of cleaning supplies to keep your home spotless, but now you find yourself with another conundrum. How do you keep all those oddly shaped bottles organized? You might be tempted to stash them all under the kitchen sink, but that can be dangerous if you have little ones or pets running around. Basically, you need everything accessible, but high enough to guarantee that it's out of reach. The good news is you only need one easy-to-find item to fix your storage issue: an over-the-door organizer. 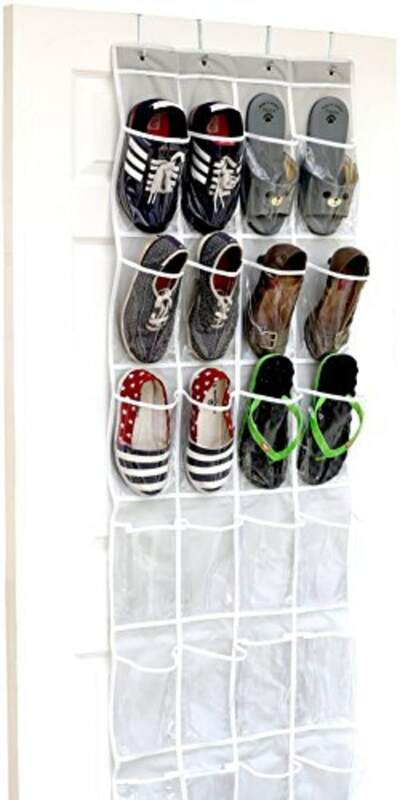 Hang the over-the-door shoe organizer near your laundry or bathroom. Fill the empty pockets with sponges, sprays, wipes and any other cleaning supplies you use regularly. Make sure you select an organizer with plastic or mesh pouches so that you can see the products easily. This will keep you from fumbling through each pocket to find exactly what you need. This $8 shoe organizer from Amazon fits the bill and boasts more than 3,000 reviews and a 4.7-star rating. You can also use the same trick to organize your bathroom toiletries! Use a shoe organizer to store hair tools like brushes, curling irons and blow dryers. And voila! It's so simple and brilliant at the same time.